Harmonix has just revealed release date and pricing for Rock Band Blitz, their new downloadable title which offers a different way to play your Rock Band music library in an arcade-style, single-player game. Rock Band Blitz will arrive on PlayStation Network August 27 and be priced at $14.99, followed by Xbox Live Arcade the following day for 1200 MSP. Additionally, four new songs were revealed for the game, bringing the total number of known tracks to 19. "So Far Away" from Avenged Sevenfold, Fun's "We Are Young" and My Chemical Romance's "Sing" will appear alongside the always funky, "Jungle Boogie" by Kool & The Gang. 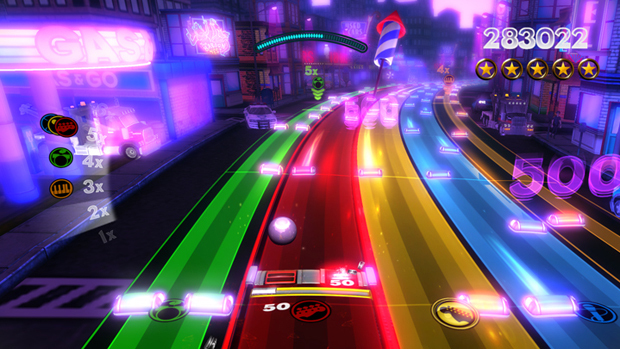 All tracks for Rock Band Blitz are cross-compatible with Rock Band 3, and vice versa. I've played Rock Band Blitz a couple of times now and every time I walk away it's with a sense of longing. My Rock Band 3 play hasn't ever really slacked off and I still pop it in about once a week, so I'm eager both to get a whole mess of new songs while injecting new life into the already substantial library of songs I already have. At least now I know how much longer I'm going to have to wait. Six more weeks!